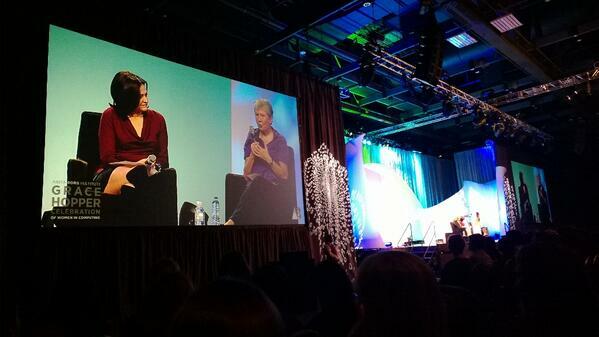 This morning I attended the first Keynote of GHC13, which included a fascinating discussion between Maria Klawe (President of Harvey Mudd College), Sheryl Sanderg (COO of Facebook) and Telle Whitney (President of the Anita Borg Institute). What a great way to start the day! From Maria, we heard about some of the ways Harvey Mudd was able to increase the percentage of women in their CS program from 15 to 40%. Klawe doesn't take credit but says that Mudd helped change the numbers in a few ways - by making the intro CS for beginners' course the 'gold' course (instead of black), by making it fun and exciting and showing real-world applications related to robotics and physics. As more women took the class, more women considered CS as a major. Sheryl talked about her Lean In initiative and foundation. She gave some personal examples about why it matters and the impact it can have on women's lives, the most shocking of which was a story about how at a recent conference, a fellow panelist said to Sandberg, "Most women aren't like you Sheryl, they aren't competent". While I've heard some of her stories before, I think Sandberg really moved the audience and got people thinking about why we should have events like GHC and why they are important. She said, "We need events like this [and Lean In Circles] because gender bias exists; we need to acknowledge it instead of hiding the problem". After hearing her story of her panel experience, I think we all can (and should) get behind that statement.